During my first year at Peckerwood, a strange plant suddenly appeared in a raised bed near John’s house. The intriguing foliage was unfamiliar to me, with each leaf bearing toothy-edged finger-like lobes jutting out in all directions. At first, the leaf looked green, but the more I focused on it, a blue hue became increasingly apparent. The point from which the lobes radiate out from is accentuated with a silvery splotch. I noticed flower buds, but I missed blooms that quickly aged to amber. More buds, and the next day they were again crumpled vestiges of this mystery flower. Then pendulous fruits began to form, green and roughly the size and shape of a small chicken egg. This still didn’t give me any further clues as to the plant family. Finally, one day a flash of gold through the vine-covered lattice immediately got my attention, and I realized it was a flower that was actually open. I rushed over, not wanting to miss this opportunity, and there it was, a pleasantly gaudy, bright-yellow five-sepaled flower. Four of the petal-like sepals bore brush strokes of blood red at their bases, the fifth solid gold individual seemed to be the outcast, shunned in the opposite direction from the red-marked cohorts crowded on the opposite side. I realized I had seen this flower in one of my books, a photo online…somewhere, but the name still eluded me. A friend homed in on the genus – Amoreuxia – when he saw the photo I posted on Facebook. Later, John confirmed it was A. wrightii, one of the several species native to the southwestern U.S. and northern Mexico, all with similar flowers that earned the collective common name “Yellowshow”. Wright’s Yellowshow is native to southern Texas and into Mexico. John said he has seen extensive desert flats covered with flowering plants across the border, but in Texas, it is found more infrequently. The plant currently in the garden was descendant from the original that John received from the late noted San Antonio gardener Margaret Kane around 1985. 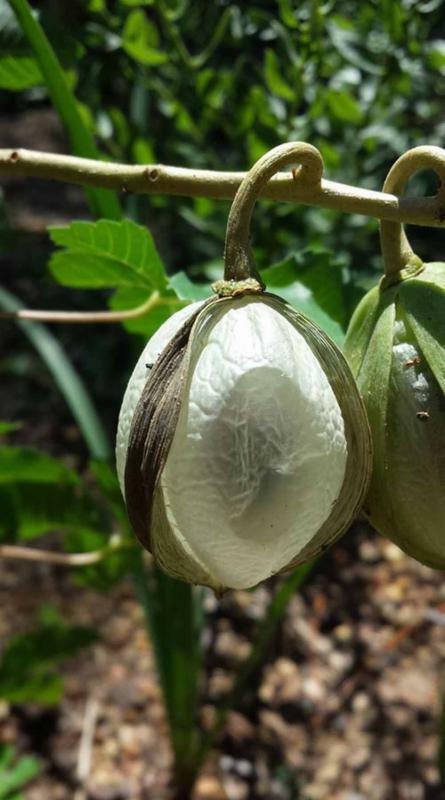 John’s description of the fruit left me checking the plant daily, looking forward to the green pod transitioning to a translucent thin shell “resembling a sheet of mica” as he put it. Every day I checked it remained green, then it was gone. This plant, first eluding me with the flowers, which only are open for a few hours in the late morning, was now frustrating me with the anticipated mature fruits. I then learned that Adolfo, our head gardener, also had been watching and collected the mature fruit and extracted the seeds. 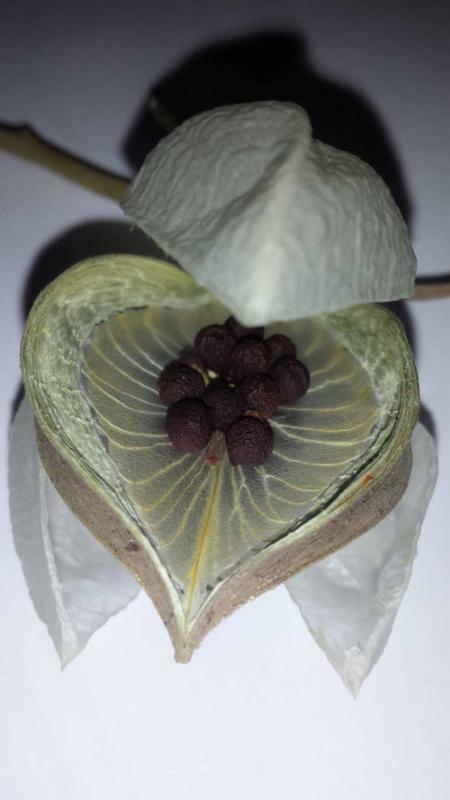 This year, I finally saw a mature fruit, hanging like a miniature Japanese lantern with the delicate, see-through membrane unveiled by the formerly green covering that had split and shrunken back to the fruit’s three longitudinal ridges. Visible inside the three conjoined capsules were dark clusters of seed adhered to the center of the inside wall in a neat cluster. 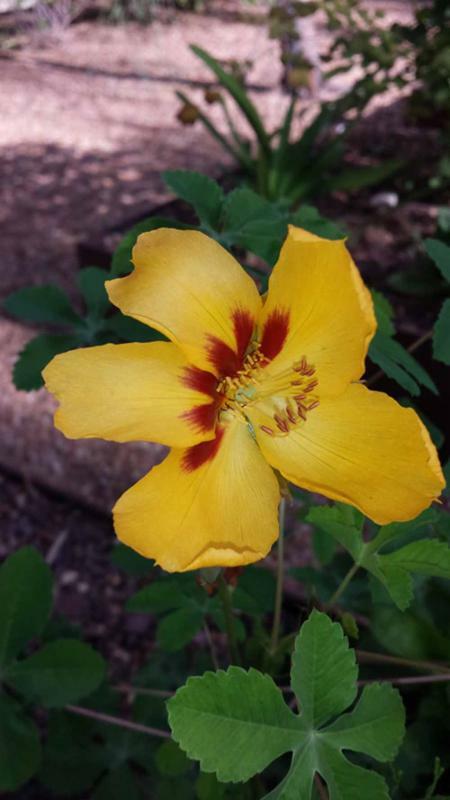 Though easy to grow in full sun and well-drained soil, Wright’s Yellowshow will always offer the busy gardener the anticipation of one day being at the right place at the right time, to finally observe a flower in its full glory after finding many taunting remnants of flowers missed. Then you then will need to pay close attention to catch the fruits when they mature, deceptively hidden under the foliage, into their easily overlooked works of delicate art. Germinating easily from seed, it can be one of those pass-along plants that can continually offer the same challenges of timing to those who wish to catch a glimpse of the Yellowshow’s elusive beauty.